Sometimes a young player with lots of talent and ability remains unnoticed as his team was not able to draw attention of crowd and critics. Same has been the case so far with young West Indian Batsman Evin Lewis. Explosive at the top of the order love to hit sixes just like his inspiration Chris Gayle. 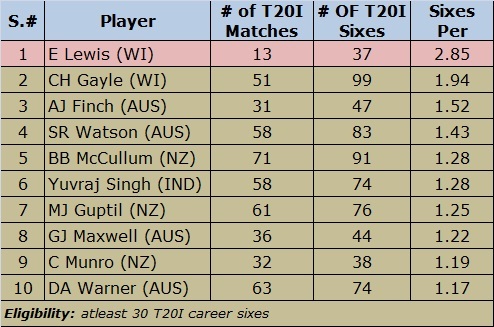 Although Evin Lewis have just played 13 T20I matches so far but his ability can be gauged by his 37 career sixes which his giving him average of 2.85 sixes per match which is highest among all the players who have played T20I and have hit at least 30 sixes in their career. Guys like Shahid Afridi, Chris Gayle, Glen Maxwell and Brendon McCullum who all rated as fierce power hitters are well behind this youngster in sixes per match average. 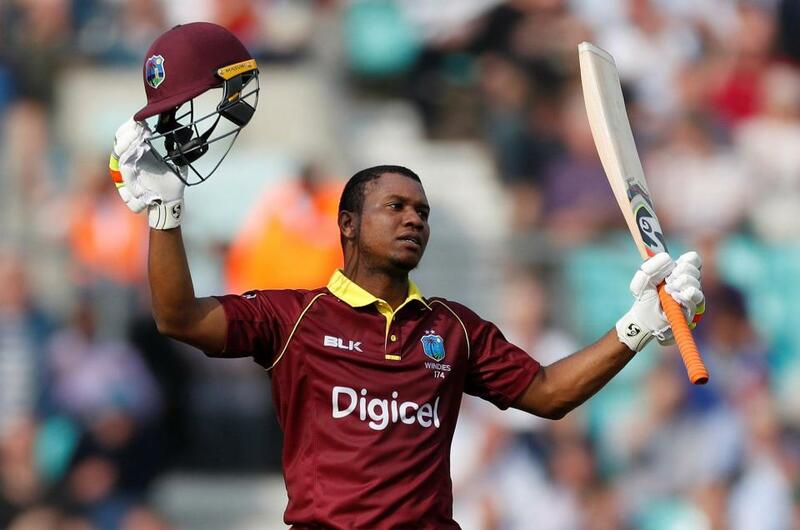 Evin Lewis made his debut for West Indies in 2016 and so far represented his national side in 19 one day international and 13 T20 international matches. In his brief stint at international level he has shown some great power and expressed his ability of hitting big sixes. After making restrained start to his international career he first showed glimpse of his talent in a one day international against Srilanka where his team was chasing a mammoth target of 330 runs to win and based on the recent record of West Indies in ODI’s its look unachievable but young Evin Lewis had other ideas and he took the attack to the Srilankan bowling and scored an emphatic 148 runs of just 122 balls with 15 fours and 4 sixes but after his dismissal it fell away & West Indies lost by 1 run. He displayed his brutal powers in T20 format when after scoring a duck in his 1st T20I against Afghanistan he destroyed the Indian bowling in very next match by scoring his first T20I century of just 48 balls with 9 towering sixes. Although he is not very consistent so far but he has continued to show glimpses of his talent in between the failures he had. He bludgeoned Pakistan attack to all parts earlier this year when he punctuated his innings with 9 sixes and scored 91 runs to get the man of the match award. In his last T20I against India he again got man of the match award by scoring his third international hundred and second in T20I when he scored 125 runs of just 62 balls with 12 sixes, which are also the third most sixes in a T20I innings by a player. Evin Lewis continued his form in current season of Caribbean premier League where he is representing St Kitts & Nevis Patriots. So far he has scored 212 runs in 6 innings with strike rate of more than 162 runs per 100 balls. West Indies Cricket Board needs to show patience in handling this 25 year old dynamite that has the natural hitting ability and can serve West Indies for long if handled with care.